Watching President Obama's historic visit to Africa this past week, I was struck by the attention he gave to young people. "The heartbeat of Africa," he called them -- a reminder of the fact that one in three people in Africa today are between the ages of 10 and 24. This means that the young people of today are going to be determining the fate of Africa in the very near future. If they are given information in school about the importance of clean water and safe hygiene practices, today's young Africans could soon be leading countries where fewer kids die from preventable water-related diseases and more lead healthy, productive lives. Every time I visit schools in Africa, Asia or Central America where I see students drinking polluted water, I think of my six grandkids. Why shouldn't all children have access to safe water in the same way that they do? Why shouldn't all grandparents be able to enjoy that same peace of mind that comes from knowing that their grandchildren won't suffer the debilitating effects of diseases related to the lack of toilets and good hygiene education? And why shouldn't every child be able to dream of becoming a doctor, and have a good chance of making that dream come true? Clean water and toilets are essential human rights, not a privilege. When I describe to my grandchildren how millions of kids their age get sick and miss school or even die from drinking dirty water -- the only water they have access to -- their response is one of shock and disbelief. "That's so unfair!" they say, and I agree. Not having access to clean water and a safe place to go to the bathroom is simply not acceptable. Children and young people are disproportionately affected when clean drinking water and toilets are not available. Just this month, the UN Children's Fund (UNICEF) released a must-read report emphasizing that sustainable development starts and ends with safe, healthy and well-educated children. Not only does the report present tried-and-true arguments for prioritizing investments that will ensure that all kids are given a strong start in life, it also calls on governments to target children and their families who are the most forgotten and excluded from essential services and resources. Time and time again in my work at WaterAid, I have seen how critical clean water is to child and maternal health. In many countries, surviving the first year of life is already an achievement. Safe drinking water is a must for helping them reach that critical fifth birthday without suffering from the life-long effects of malnutrition and stunting. Countries cannot achieve their full potential if they are failing to invest in the health and wellbeing of their youngest citizens, and no single intervention is more likely to reduce global poverty than creating access to safe water and toilets. While we are making tremendous progress, roughly one in ten people still do not have access to clean water, and 2.5 billion people do not have a toilet. This is why I say to young people: the water crisis needs you to take action. At WaterAid, we believe that safe drinking water and sanitation can be a reality for everyone, everywhere by 2030. Part of the reason we believe this is because young people worldwide are stepping up to tackle water poverty and build futures in every corner of the globe. One of my favorite examples is an inspirational young man named Willice who serves as a WaterAid Youth Ambassador for Water, Sanitation and Hygiene, and as Chairperson of the International Youth Council in Kenya. As a Youth Ambassador, Willice is directly involved with global advocacy work that puts young people at the heart of development policy and practice, and shapes the future of clean water, safe toilets and effective hygiene education. Here in the United States, Millennials and moms alike are making their mark on-line by raising money and awareness about an incredible project to build over 100 toilets and 150 water taps in 31 schools across Madagascar this summer, while students as young as second grade are organizing walks for water that help to fund rainwater collection systems and student-led Hygiene Brigades at schools in Nicaragua. The water crisis is a beatable one, and each of us has a role to play. As someone who has the joy of watching six healthy grandchildren grow and follow their dreams, I join in President Obama's rallying cry and commitment to the youngest among us: it's time to make the future count. 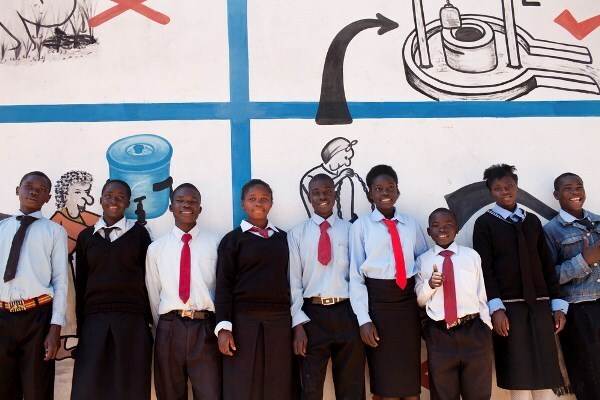 Student water and sanitation committee in front of the "talking wall" a hygiene education tool at Luvela High School in Zambia.